Sometime long ago, I learnt these two definitions. # Success is getting what you want. # Happiness is wanting what you get. Over the years, from experiencing the inscrutable nature of Life, I have come to understand that Life just happens. It has no agenda or desire to cause us any suffering. Yet we suffer all the time because we have this expectation that our Life must be different from what it is. Our suffering pushes us into the dark recesses of unhappiness and we languish there hoping someday that we will be happy when things get better. And when things get better, as they always do, you soon find that you don’t have much time. 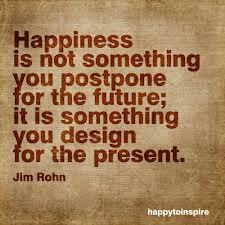 And that makes you unhappy for a different reason, all over again – you wish that you have not postponed happiness. You wish you had lived a more complete and fulfilling Life! So journey through Life wanting what you get. Because if you postpone happiness while waiting too long to get what you want, you may well end up not having enough time to enjoy what you finally, eventually, get!